Planning a romantic Big Sur camping outing may be the perfect idea to escape that routine of everyday drudgery. 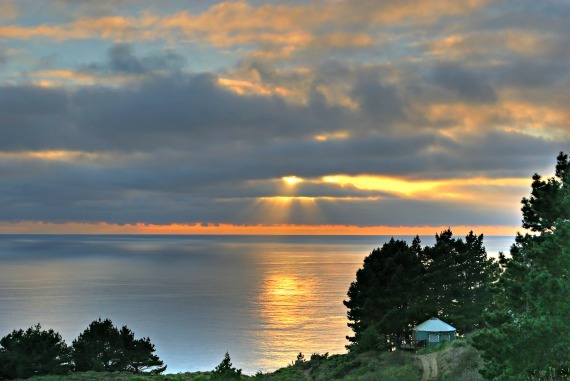 If you like the idea of camping in a rugged setting within close proximity to great dining and an endless list of things to do, then a few bliss filled days of Big Sur camping may well be the needed prescription. I met Craig on my last trip to Big Sur. 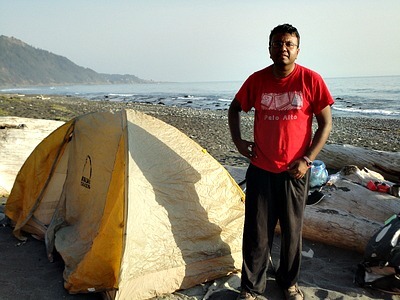 He was bicycling the Pacific Coast and has some insight for your next visit in the video below. Imagine ancient seven hundred years old redwood trees that shaded these valleys long before the vision of California was a reality. Then add the sights and sounds of wildlife along the rugged cliffs of the Pacific Ocean, sprinkle in waterfalls and perfect hiking destinations, and you have the beginning, just the beginning idea, of what romantic pull awaits you and your companion when you consider the possibilities of Big Sur camping. Pfeiffer California State Park is only twenty six miles from Carmel and a campers dream with everything you could ask for. Many campsites are reasonably private if you reserve well in advance. 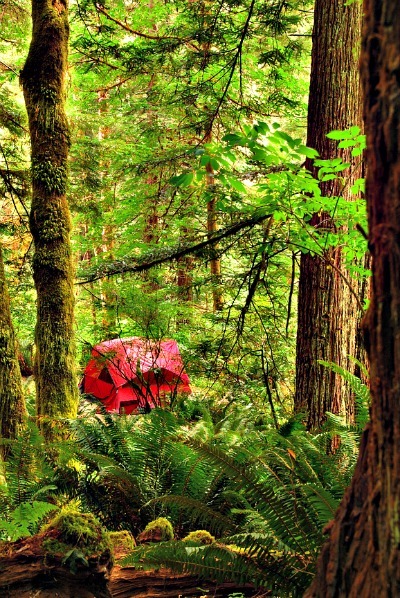 You might even be able to reserve camp sites #52, #53, #176 or #179 which are among the best. Tall trees, showers for $1.50, and the proximity to the nearby lodge, make this a great place for Big Sur camping. There is even a restaurant, a small grocery store and firewood available if you tire of hiking and condor watching. This area can be foggy in the summer and poison oak is everywhere so plan ahead. If the weather puts a damper on your experience you can always stay in one of the sixty one cottages in the park complete with fireplace and dinettes. One might even consider this place for a last minute romantic getaway especially if you are arriving on a Sunday or Monday. The smell of late night campfires or the sight of fires in the evening sky all add to the charm and relaxation of being here in this perfect location. If you love the outdoors but want a little more comfort check out the cottages inside the park. 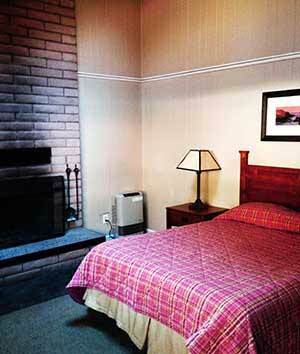 These are set up with your own kitchenette, bathroom and wood burning fireplaces. I have been here several times and have camped in the woods and been in these cottages and I must say, the cottages although not inexpensive are really nice and romantic! 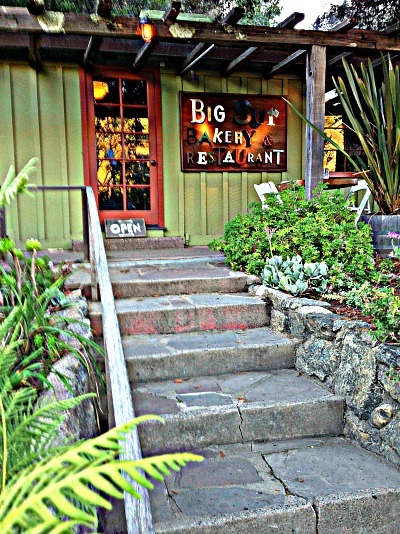 For a treat on your camping adventure,stop by the Big Sur Bakery in the village and treat yourselves to fresh apple strudel. This well known tiny bakery and restaurant is best know for early morning baked specialties. Make sure you save time for the many Big Sur hiking options. Julia Burns was a well known pioneer and back country women in Big Sur and this park is dedicated to her unselfish contribution to the area. This park is often overshadowed by it's sister Pfeiffer Big Sur State Park about ten miles to the north, but offers more privacy and the only waterfall in California that drops about one hundred feet directly into the Pacific Ocean. You will see postcards and videos of this park wherever you go in Big Sur. Follow McWay creek as it goes under a tunnel and then out to the Pacific where you can see the falls. No camping in this park but whale watching is a popular pastime in March and April as the Grey whales journey from Baja Mexico to the colder northern waters of Alaska. As you travel down the coast and well before you reach the village of Big Sur, and after you see the cows grazing above the cliffs near the lighthouse, be sure to take the right turn off the Pacific Coast Highway to Andrew Molera State Park and explore the possibilities of Big Sur camping here. This is a place where walking hand in hand just comes naturally as you listen to the waves crashing on the sand and the occasional sea lions barking in the distance. Getting to the beach requires a hike but the views are terrific and the beach walk is well worth the journey. Farther down the coast about fifty five miles South of Carmel, is Limekiln State Park. There are twenty four campsites with flush toilets that offer breathtaking views of the rugged coast and California redwoods. The park features a camp host who can answer your questions about Big Sur camping, and direct you to lesser known views of the Big Sur Coast, the beauty of the redwoods, and information about camping by the river, near the tall trees or directly on the beach. It was recently opened in 1995 and is small and somewhat crowded, but still a great spot to stop if you are on the way to Hearst Castle or other long drives. There are a few easy and short hikes to a tiny waterfall and the beach. Treebones Resort is a little farther down the coast about thirty two miles after you leave Big Sur Village. The Handy family built this enclave on eleven acres and set aside part of the land for camping although they are famous for their yurt style accommodations. While you are perched above the cliffs of the Pacific Ocean, there is no absence of amenities. Enjoy the Treebone Resort's fifty six foot long bar that overlooks the ocean, massage and a great restaurant where you can enjoy sushi. You can camp here or stay in a yurt ...book early and ask for yurt #15. You will have fantastic views...and just a bit quirky, but a real natural experience. It can get windy at times so if your camping, take some extra layers of clothing just in case. In short, this is great!. It's a unique Big Sur experience that you won't soon forget and what's not to like about waking up with an unobstructed view of the Pacific Ocean and then later in the day...fresh sushi made with a masters touch. Camping in the private Big Sur Campground and Cabins has it all, but be sure you understand this is a little more crowded than you might find elsewhere. You will find tents, tent cabins, cabins with baths, RV hook ups, clean bathrooms, and even root beer floats for a $1. 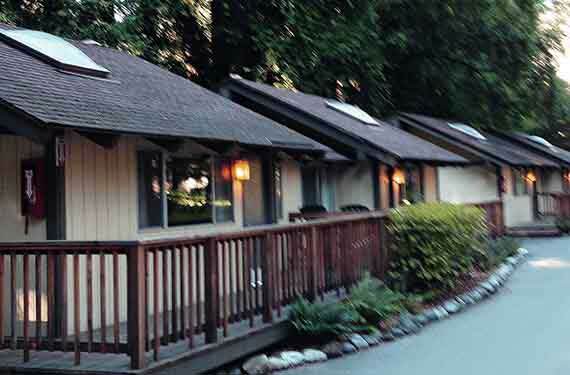 Friendly staff and after hours curfew make this Big Sur camping experience couple friendly and a good choice if you don't need lots of private space. While the idea of camping as a romantic escape may seem odd at first, it is an extremely popular and affordable way to get of of town and focus on fun and relationships. The locals in Big Sur would suggest it's the negative ions in the ocean air. Whatever it is, you will feel it if you stay long enough in Big Sur. It's a common theme here, and your relationship will likely be stronger because of your visit. Once you discover the "Big Sur" you will likely return ... there is so much more to see!